Honiton Clock Clinic is a family run business situated in the old market town of Honiton in Devon, which is said to be the antiques gateway to the Southwest. 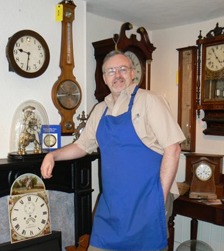 The proprietor Mr David Newton, opened the clock clinic back in 1990, and now runs the business with his wife Tracy. The clinic is offering the public a long needed service, restoring and renovating clocks and barometers in a traditional style.